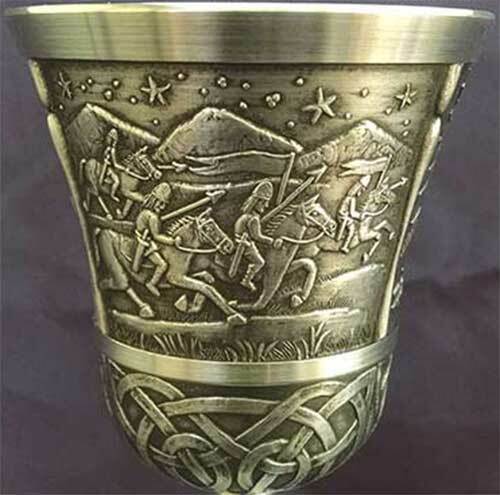 The Irish legend of Queen Maeve of Connaught as depicted on this Celtic Goblet from Mullingar Pewter. This great lady ruled in Ireland about the time Cleopatra reigned in Egypt, also long before the Roman's reached Britain but not ever Ireland of course. King Eochaidh (Keogh) of Connaught had six children - three boys and three girls. For some reason or other the three boys in manhood rose up against their father. In a great battle at Mullingar all three lost their lives. Of the three sisters, Maeve was the youngest, brightest and adventurous. To strengthen his own position in the land King Eochaidh offered Maeve in marriage to Conor the King of Ulster when that royal dignitary expressed an interest. Dutifully, Maeve travelled to Ulster but did not stay with Conor because, perhaps, Conor seemed more strong minded than was she. By coming back to her father's hegemony Conor was furious but married Eithne her sister. The other daughter was Clothra (Clora). How this beautifully named girl got on is not made clear. 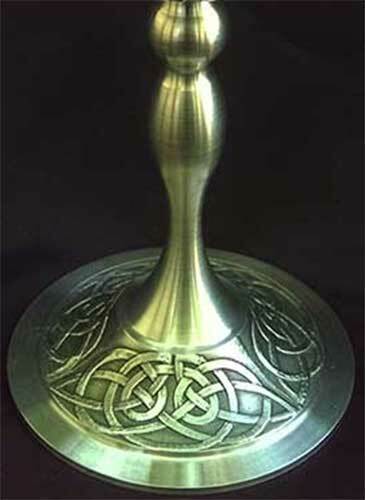 King Eochaidh married off his youngest daughter Maeve to his great chieftain and champion Ailill and made of her his heir to the throne of Connaught. Oddly, the King and her husband died soon afterwards. She was now Queen Maeve, all powerful, strong and ambitious but needing a husband. Using a great phalanx of messengers, heralds, courtiers, body guards, horses, chariots and bond-girls the Queen of Connaught carried out a tour of inspections of males in royal houses all over Ireland ending up at the seat of Ross the Red, King of Leinster, at Naas. There is no evidence that Maeve herself was a beauty but she selected a fair handsome effete young son of Ross seventeen years her junior. Two children arrived. Rows between them developed sometimes-silly ones. The most famous recorded one in literature had to do with ownership comparisons like, for example, which of then owned the most wealth, best treasures, gold head ornaments, gold collars, bracelets, gold vessels, fine clothing, horses, chariots, bond-servants, cattle and much else. Independent adjudicators found them equal except that Ailill owned the best bull, which infuriated Maeve. No way would she be second best to Ailill especially over a bull So the doughty Queen ordered her principal Courier, named MacRoth, to go and find the best bull in Ireland. MacRoth did so. It was called the Brown Bull of Cooley (Donn Cuailge). That peninsula at Carlingford Lough on the other side of Ireland in Ulster. The owner Daire Mac Fiachna was besiegedby offers he could not refuse. He was requested to loan it to Maeve at her seat of power in Roscommon. Nothing worked out that way as Daire had reason to change his mind causing great armies of warriors to clash. Unbelievable adventures took place including protection of Maeve by the great, widely loved man of power and strength Cuchulain himself. All this happened, not to mention of handlers forcing a temperamental bull all the way from Carlingford across the lordly Shannon to Roscommon pursued by enemies. Eventually Ailill's bull resented at first sight the stranger now arrived on his own territory. The clash, big head to big head, long horn to long horn, was so horrendous as to cause people to flee to the hills for protection. Never was the like of what happened seen before by anyone in Ireland. Who won ? Well dear friend no one knows. 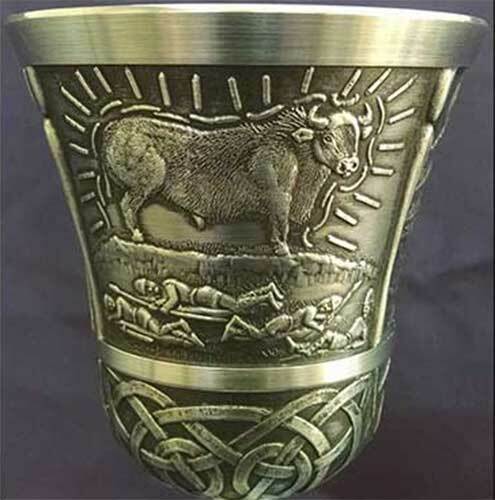 This Celtic goblet features the Queen Maeve of Connaught Irish legend embossed on three pewter panels. 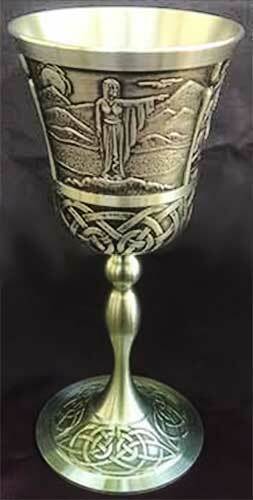 The pewter Irish legend goblet is enhanced with Celtic knot-work both under the panels and on the base. 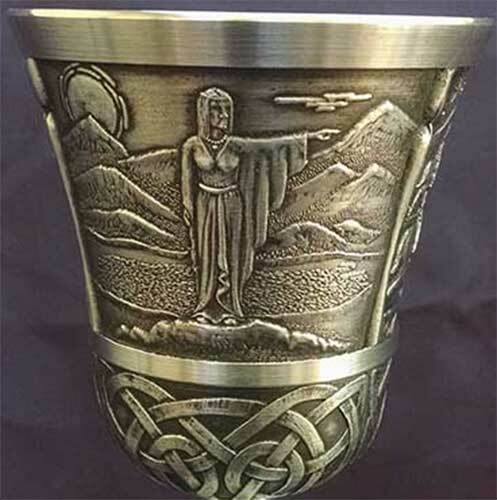 The Queen Maeve goblet is crafted of lead free Irish pewter and measures 3 1/4" wide at the rim x 7" tall.